At the end of every enquiry unit, parents are invited to school to observe what our children have done. We are also encouraged to ask the kids questions about their work. This is something I’ve always struggled with because I never know what to ask to make it meaningful. How can you make it meaningful? By asking them metacognitive questions – the kind of questions that make them think more deeply about themselves in relation to what they’ve learned. By the way… if you’re not sure what metacognition is, I’ll refer you back to our article on the topic so you can read more about it: Metacognition – Learning Better by Understanding How We Think. 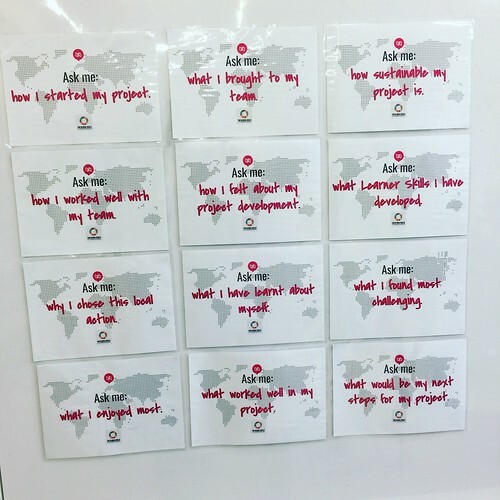 Recently, we were invited to school to look at the final enquiry unit the kids had been working on: “Think Global, Act Local”. In this unit, they had to choose one of the UN Global Goals for Sustainable Development and think about how they could make an impact on their local community. While walking through the classes to look at the work they had done, I noticed a cheat sheet of questions to ask posted on the walls. This enquiry end point has probably been my best interaction with the kids! So there you go… if you’ve been struggling to think of meaningful questions to ask your child about their learning, try these. They work for any learning context – not just for school related activities. Well okay, some of them might need to be tweaked a little to be applied to other activities, like question 7.